A quality management principles review led Escarmat to renew its quality manual. 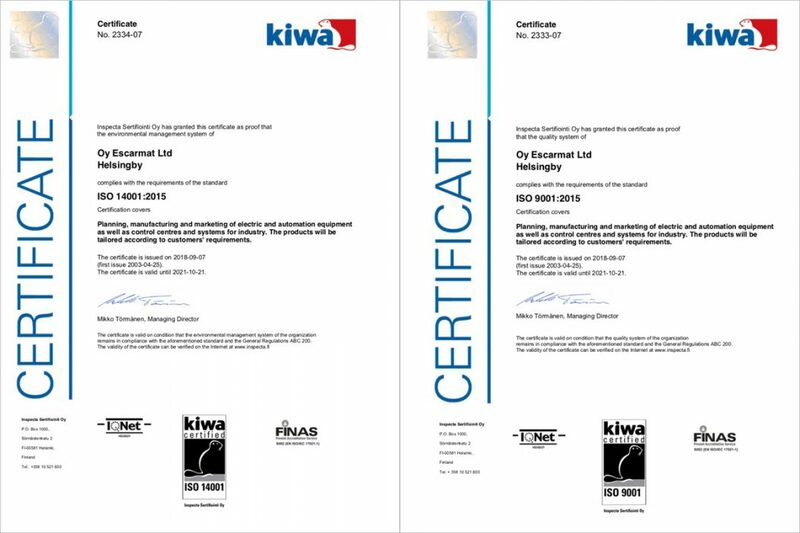 At the same time, the used Quality Management System was updated to the new ISO 9001:2015 version and the Environmental Management System to the ISO 14001:2015 version. “The customer is important and ISO standards aim to improve customer satisfaction. They are a good managerial tool”, states Nora Möttönen, Escarmat’s Production Manager. Möttönen believes that the new standards support companies in moving from words to action as visible operational development and results are required. Escarmat also now more closely monitors, how improvements are implemented. Escarmat updated its operations and quality manuals according to the 2015 versions already last year, but was officially certified within the framework of the annual audit in this October. Möttönen sees improvement already. Regarding the new environmental management system standard, it’s important to note, that the old standard focused on developing the company’s environmental system, and the new 2015 version already pushes for specific actions to improve the level of environmental protection. “Our specific goal is to reduce the volume of lead waste”, Möttönen states. In addition to the ISO 9001:2015 and ISO 14001:2015 standards, Escarmat also holds an up-to-date OHSAS 18001:2007 certificate.